If you are looking for camping on the Gunflint Trail, look no further! 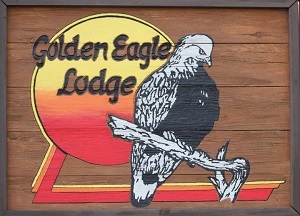 Golden Eagle Lodge offers a private campground with the same personalized service as our cabins. We have 9 sites, each with a picnic table, fire ring, and water and electric hookups. Electric service is 20, 30 and 50 amp. WiFi is available in the main lodge building. Our heated shower house has 2 modern bathrooms with hot water and flush toilets. One Bathroom is wheelchair accessible with a roll in shower. A dump station is also available. These sites were designed to accommodate all sizes of RVs, Campers, Trailers, and Tents. To keep the wilderness feel, we limit each site to only 1 camping unit (1 large tent OR 1 Camper OR 1 RV) and a maximum of 6 people. For those who wish to camp together, we offer 2 sets of adjoining sites, #2 and #3 or #4 and #5. For additional activities and programs, visit our activities page. All 9 of our camping sites offer water & electrical hookups. Rates are on a per-night basis. A $37 deposit per site is required when making a reservation for less than 1 week or $74 per site per week. The balance is due upon arrival. These deposits are NON-REFUNDABLE. To avoid any misunderstanding, you will be charged for the number of nights reserved. Personal checks welcome. Discover, MasterCard, and Visa accepted. Your deposit is due within 10 days of making the reservation.